Sam: Dad for me? That fight that was a lifetime ago. I don't even remember what I said, and -- I mean yeah. You know what? You did some messed-up things. But I don't I mean, when I think about you and I think about you a lot I don't think about our -- our fights. I think about you I think about you on the floor of that hospital. And I think about how I never got to say goodbye. Sam: I'm sorry, too. But you did your best, Dad. You -- You fought for us, and you loved us, and that's enough. John: Okay. I mean, me versus your mom? That's -- That's not even a choice. The hunter Jules is named after the Managing Editor of the Supernatural Wiki, Jules Wilkinson, who is rather fond of cataloging. The character appeared in 14.03 The Scar. It's shown that the Winchesters go by the aliases Sam and Dean Campbell in Lebanon and are well known in the town. Campbell is their mother's maiden name. 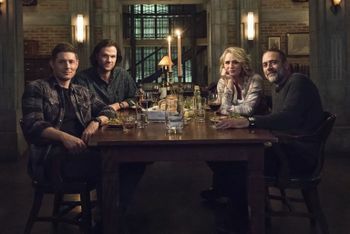 Additionally, Sam and Dean appear to have become something of an urban legend to the kids of the town who note their strange actions, including the times Sam and Dean have driven around with a living being in the Impala trunk. Sam and Dean appear to be driving a black 1956 GMC 100 -- most likely one of the many classic cars to be found within the Bunker's motor pool. John previously drove a black 1986 GMC Sierra Grande after handing the Impala's keys off to Dean. Due to the Fall never happening, Zachariah and Castiel both have their wings intact. When they arrive, the flapping of their wings can be heard and Castiel's full wings are seen when he displays them to intimidate the restaurant patrons.